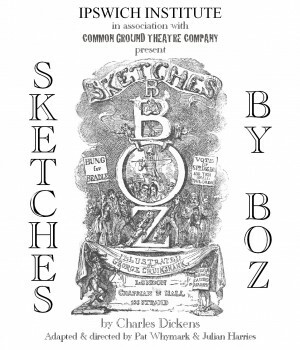 “Sketches by Boz” is a dramatized compilation of some of the stories featured in Dickens’ first book of the same title. All the stories are set against the background of the metropolis and combine observation, fancy and fiction to create a vibrant picture of London life in the 1830s. We will meet the priggish bachelor Mr Minns in his “brown frock coat and light inexplicables” and the byronesque Horatio Sparkins. We will witness the Private Theatricals of Mrs Joseph Porter and marvel at the complexities of The Great Winglebury Duel. The production is a script in hand performance by Common Ground Theatre Co in association with The Ipswich Institute, featuring local actor Julian Harries as Charles Dickens. Along from the Great White Horse the then recently founded Ipswich Mechanics’ Institution had just moved into the premises it still occupies today. The present Ipswich Institute, now an independent library and educational charity, is proud to mark the bicentenary with this production.